No one expects the UK to have good summers. But this one is particularly woeful, combining the appearance and feeling of being trapped inside Tupperwear. 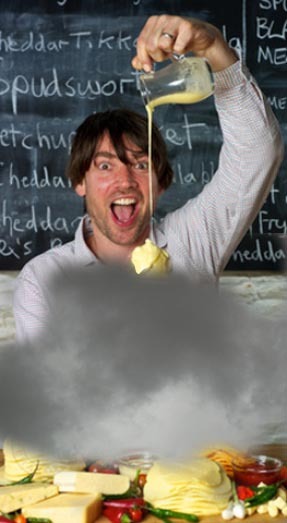 Thankfully, Alex James is trying to push back the drizzle using the only technique he knows: the liberal application of molten cheese. And if that doesn’t work, today has birthed three new musical devices to cheer up the UK’s miserable music lovers. Firstly, Internet-straddling uber-aggregator Hype Machine has launched a UK-specific home page that shows exactly what’s happening on the UK-based blogs. Secondly, Music Robot is a brand-new whizzy website that pulls together the feeds of a selection of the UK’s music blogs (of which, incredibly, ANBAD is one). FIRST! ANBAD’s love for the gonzo aural splashings of Lisbon’s Youthless is well known. They have released a steady stream of terrific lo-fi, hi-tempo, uber-hooky scuzz-pop songs for a while now; Drugs is just another step on the road to that point in the future where crowds everywhere get off to their infectious enthusiasm. SECOND! Greetings are a Cardiff-based band on the amazing Owlet record label, and this if You Make Me Crazy is a sign of things to come, once they’ve gigged themselves to death in Wales, their forthcoming releases should be something to look out for. Posted on July 11, 2012 by Joe Sparrow. This entry was posted in Headline, Today's New Band. Bookmark the permalink.